Oneonta Public Transit wants to provide a safe and pleasant environment for all of our passengers. Please help ensure a safe and comfortable experience by being courteous and respectful to others. Please observe the transit systems rules when on the bus or at the John Insetta Transportation Center. 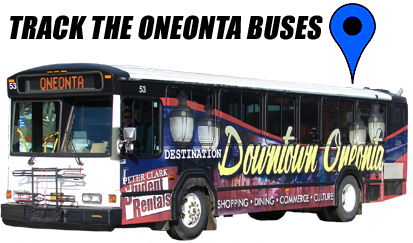 Passengers that are in violation of the transit system rules will be requested by authorized personnel to discontinue the misconduct or to leave the bus or the John Insetta Transportation Center. Individuals that refuse a request to leave the bus or the John Insetta Transportation Center are subject to arrest for trespassing and may be denied future access to the bus system. Oneonta Public Transit reserves the right to monitor passenger behavior with the use of video cameras. Passengers that engage in unacceptable behavior may be denied bus service and/or access to the John Insetta Transportation Center. ° Illegal Drugs – Drugs not obtained by doctor’s prescription. ° Weapons – Firearms, knives, etc. ° Shirt and footwear must be worn on the bus and at the John Insetta Transportation Center. ° Personal hygiene must be maintained in a manner that does not result in offensive odors. Passengers with poor hygiene can be denied transportation. ° Eating is prohibited on the bus. All trash must be taken off the bus with the passenger. ° Passengers may bring beverages in a spill proof container, such as a screw-top bottle or a cup with a secure lid. ° Open beverage cans or cups with flimsy lids are prohibited. ° Open and uncovered alcoholic containers or the consumption of alcoholic beverages is prohibited on the bus and at the John Insetta Transportation Center. They may not be left on the bus. the driver or other passengers). © 2019 OPT Rides. All Rights Reserved.